Anthony Cerami (right) and David Wallach. Anthony Cerami and David Wallach have – in their own individual way and independently of one other – decoded the significance of TNF, helping make the neutralization of TNF one of the major therapeutic principles in medicine. Anthony Cerami from the United States and David Wallach from Israel received the Paul Ehrlich and Ludwig Darmstaedter Prize for 2018 in the Paulskirche, Frankfurt. The award is being given in recognition of their basic research into one of the immune system’s most important cytokines, TNF. „Basic research in medicine sets itself the goal of creating new and better treatments. It is based on translation. The research conducted by the two prize-winners is a unique example of the successful translation of fundamental immunological findings into a clinically relevant therapy,“ wrote the Scientific Council in substantiating its decision. Rheumatoid arthritis, psoriasis, Crohn’s disease, and other chronic-inflammatory diseases are now treated everywhere with antibodies or proteins that neutralize this cytokine. The prize will be presented by Professor Thomas Boehm, Managing Director at the Max Planck Institute of Immunobiology and Epigenetics in Freiburg and Chairman of the Scientific Council. Cerami and Wallach are among the very earliest TNF researchers. Many of the important discoveries for which they are receiving the prize were made decades ago. The two scientists came across TNF from entirely different angles. Cerami was searching for a molecule that caused pathological weight loss, and he named it cachectin. Wallach was studying a molecule that was able to selectively induce programmed cell death. He called the molecule cytotoxin. It only emerged later that both these molecules were one and the same – TNF. At the time, TNF was being touted as a treatment for cancer, and oncologists were pinning great hopes on it – erroneously, as Anthony Cerami showed. He made it absolutely clear in 1985 that TNF is an immune system signaling molecule and that its proinflammatory effect would preclude its use as an anti-tumor agent in patients. As early as 1981, however, he had already anticipated anti-TNF therapy for inflammatory diseases in a United States patent application. Although he had not precisely identified cachectin as TNF at that time, this approach was confirmed in 1985 when he determined that these two molecules were identical, and proved that TNF/cachectin neutralization using antibodies prevented septic shock in an animal model. This work provided a cornerstone for the development of anti-TNF therapy for treating a wide spectrum of inflammatory diseases, including rheumatoid arthritis and Crohn’s disease, among many others. TNF basically works like a fire alarm. The molecule appears in the blood within minutes of an injury, an infection or a stress reaction and sets an inflammation in motion as a response to the emerging danger. Sometimes, however, the inflammation spins out of control, does not peter out or – as in chronic-inflammatory diseases – turns against the person’s own body. This explains why TNF is a suitable target molecule for the treatment of chronic-inflammatory conditions, just as Cerami had seen early on. Moreover, Cerami identified a variant of erythropoietin (EPO), a protein necessary for the production of red blood cells, as a natural antagonist of TNF. After all, every inflammatory reaction not only requires a trigger to set it in motion but also has to be ended again after some time so as to minimize damage to tissue. Cerami demonstrated that EPO is produced in the inflamed tissue and binds there to a novel innate EPO receptor that is expressed in response to inflammation. EPO ensures through this binding that cell death is limited and that cell regeneration takes place. A protein fragment that imitates this effect but does not possess the effect of EPO on red blood cell production – undesirable for inhibiting inflammation – and its adverse effects is currently undergoing clinical investigation. In addition to his research on TNF and EPO, Anthony Cerami also developed a test to determine HbA1c levels, which allows conclusions to be made on the average plasma glucose concentration in the preceding weeks. The measurement of HbA1c has long become a routine test in diabetes. David Wallach discovered the two TNF receptors and showed early on that TNF has two diametrically opposite effects. For one thing, the cytokine can force cells to commit programmed cell death; for another, it can ensure resistance to cell death. Wallach worked from the start on elucidating both these signaling pathways owing to his interest in these different effects. It was not apparent at that time that this approach would open up a huge field of research. Wallach discovered the two TNF receptors while searching for a natural antagonist to TNF. Wallach’s simple but powerful assumption was that, if cells induce something as radical as their own suicide, there must be antagonists that can prevent this death. The prizewinner was able to demonstrate that the receptor domains located on the outside of the cell can be cleaved and capture TNF before it binds to the membrane-bound receptors with their downstream signaling pathways. This principle is now also exploited clinically. In this therapy, a large quantity of the soluble receptor molecules neutralize the excess TNF produced in the event of chronic inflammation before it causes any damage. Although soluble forms of a few receptors have been known before, Wallach was the first to show clearly that such molecules are functional at physiological levels. This resulted in explosion of interest in the occurrence and function of soluble forms of many other receptors. Wallach’s name is also closely associated with the decoding of the two signaling pathways triggered by TNF that lead either to the cell’s death or to its survival. Which of the two signaling pathways is set in motion depends on occupancy of the two receptors and the resulting activity. Although a number of other scientists contributed to the work Wallach anteceded all in discovering and cloning major proteins – e.g. FADD and Caspase-8 – from the cell death pathway triggered by TNF. He was thus the first to show that an intracellular protease (Caspase-8) can serve as a signaling protein, directly activated by a cell-surface receptor. Today, this pathway is called extrinsic cell death pathway distinguishing it from a second cell death pathway initiated from inside the cell, called the intrinsic cell death pathway. Wallach’s discovery that a death mediating protein like TNF can also have vital function(s), has since then been shown to be the rule for almost any protein that participates in mediating programmed death. Scientists now use to say that each of the proteins that participate in death induction has a ‘night job’ (related to death) and a ‘day job’ (a vital function). Wallach’s research is recognized as an important conceptual contribution to the entire field of signaling. Anthony Cerami (77) had a long academic career and is founder of Araim Pharmaceuticals and Chairman of the Scientific Advisory Board in Tarrytown, New York. David Wallach (72) has worked for 40 years at the Weizmann Institute of Science in Rehovot. Antony Cerami (77) studied biochemistry at Rutgers University and received his PhD from Rockefeller University. Cerami was Professor at Rockefeller University for 20 years and also Dean of Graduate and Post Graduate Studies. He later established the Feinstein Institute for Medical Research. Cerami is the recipient of three honorary doctorates and is involved in a number of companies. He has more than 150 US patents and their international counterparts. He sat on the editorial board of various scientific publications during his career. Cerami has received numerous awards including the Luft Award in Diabetes and the Banting Medal for Scientific Achievement. He is a member of the National Academy of Sciences, the American Academy of Arts and Sciences, and the Institute of Medicine of the National Academy of Sciences. He is also an Honorary Member of American Society for Clinical Investigation and Fellow of the American Academy of Microbiology. David Wallach (72) studied biology at the Hebrew University in Jerusalem, where he also received his PhD. He was then a postdoc at the NIH in Bethesda. Wallach joined the Weizmann Institute of Science in Rehovot in 1977 where he has held various positions, including that of full professor since 1995. He has received a number of prizes for his scientific work, including the Outstanding Achievement Award from the International Cell Death Society, the Merck-Serono Prize, the EMET Prize in Life Sciences/Biotechnology of the A.M.N. Foundation, the Teva Founders Prize, and the Rappaport Prize in Biomedical Sciences. Wallach was president of the International Cytokine Society and one of the founders and co-organizers of the series of international TNF Conferences held every two years. He sits on various editorial boards and established an international organization devoted to the cultural heritage of the millions of Jews that lived in Galicia and Bukovina. He is currently the Chairman of this organization. 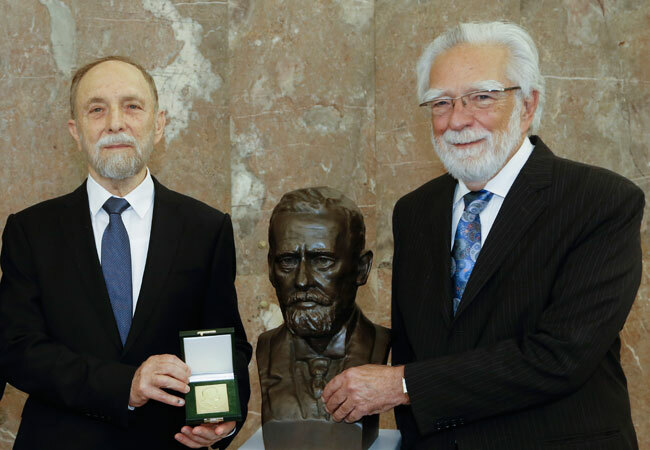 The Paul Ehrlich and Ludwig Darmstaedter Prize is traditionally awarded on Paul Ehrlich’s birthday, March 14, in the Paulskirche, Frankfurt. It honors scientists who have made significant contributions in Paul Ehrlich’s field of research, in particular immunology, cancer research, microbiology, and chemotherapy. The Prize, which has been awarded since 1952, is financed by the German Federal Ministry of Health, the German association of research-based pharmaceutical company vfa e.V. and specially earmarked donations from the following companies, foundations and organizations: Christa Verhein Stiftung, Else Kröner-Fresenius-Stiftung, Sanofi-Aventis Deutschland GmbH, C.H. Boehringer Sohn AG & Co. KG, Biotest AG, Hans und Wolfgang Schleussner-Stiftung, Fresenius SE & Co. KGaA, F. Hoffmann-LaRoche Ltd., Grünenthal Group, Janssen-Cilag GmbH, Merck Financial Services GmbH, Bayer AG, Holtzbrinck Publishing Group, Abbie Deutschland GmbH & Co. KG, Goethe Universität und die Rittershaus Rechtsanwälte Partnergesellschaft mbH. The prizewinner is selected by the Scientific Council of the Paul Ehrlich Foundation.